Windows Repair Toolbox is a small portable tool which makes it easier to find and fix many common Windows problems. The program doesn't contain any real troubleshooting technology itself. Instead, it acts as a simple front end for various third-party utilities and Windows commands. 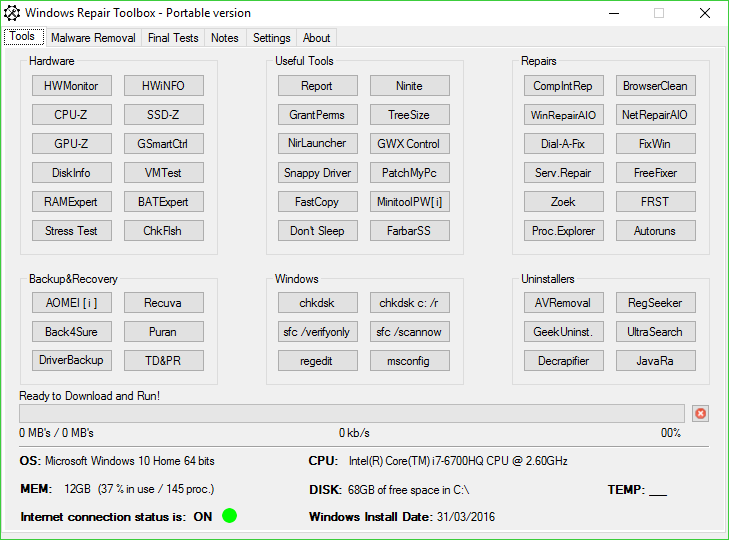 The Tools tab, for example, provides buttons for HWMonitor, HWiNFO, CPU-Z, GPU-Z, Ninite, PatchMyPC, Snappy Driver, Autoruns, Process Explorer, FixWin, Recuva, Geek Uninstaller, chkdsk, sfc, Regedit and more. Windows Repair Toolbox doesn't come bundled with any of these, fortunately. Instead, when you click something like Recuva, the program goes online, downloads the correct portable edition for your operating system, then launches it for you. The Malware Removal tab offers a little more functionality. As well as providing one-click access to many popular malware hunters - Emsisoft, Malwarebytes, Kaspersky, Microsoft, RKill, RogueKiller, AdwCleaner, Hitman Pro, more - you're able to run unattended fixes using multiple programs. Other malware-related options include a selection of update links (Windows, Java, Flash, Adobe Reader), and a few cleanup and repair tools (CCleaner, WinRepairAIO). A "Final Tests" tab provides speedy to some common system checks. Is Flash installed, or Java? Does your system open various common file types: Office, MP3, PDF, more? What's in your HOSTS file? Are your webcam and microphone working? The answers may be just a click or two away. You're able to save notes relating to your actions, which might be useful if you regularly run the program on other people's systems, and there's even an option to email an activity log to your Gmail address. What's new in 3.0.1.6 (see changelog for more)? - In the "Backup & Recovery" section, replaced "DriverBackup" with "CloneApp"
- Several other internal updates, changes and improvements.